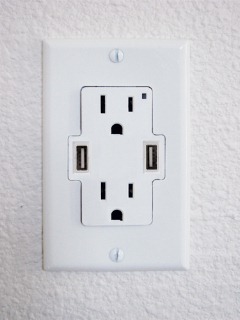 Hot off yesterday’s news of the DIY USB wall outlet (replace your standard outlet plugs with two USB plugs) comes a product that addresses the shortcomings inherent with getting rid of the standard plugs altogether: a wall plate with both standard and USB plugs. Problem solved – and it only costs $10. The “TruePower UCS Power Outlet With Built in USB Ports” is available for pre-order at FastMac.com and is expected to ship early next year. Apparently it’s “currently waiting on final UL Approval,” which is a good thing for safety’s sake.